Winston Churchill is in the news, as is often the case. On February 11th, Presidential candidate Bernie Sanders had words of praise for Churchill’s war leadership. Vox Media has criticized him and Churchill in sharp language. Are the criticisms of Churchill true? During the Democrat debate on February 11th, moderator Judy Woodruff asked the candidates to name two leaders, one American and one foreign, who would influence their policy decisions. 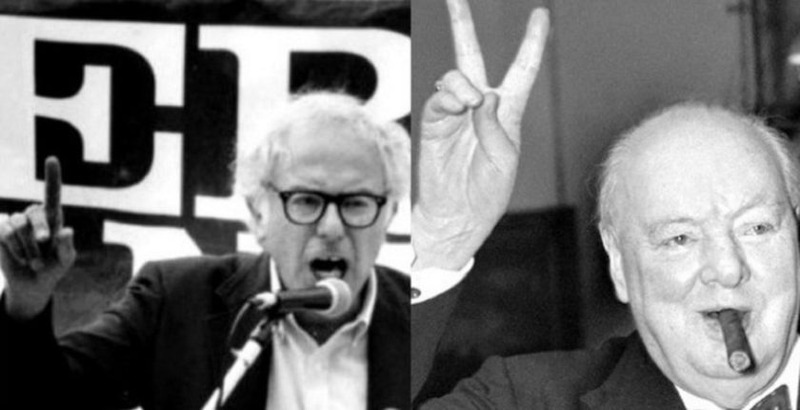 Senator Bernie Sanders chose Franklin Roosevelt and Winston Churchill. Sanders “started strong” with Roosevelt, they wrote, though he skipped foreign policy and concentrated on the New Deal in the Depression. Vox said nothing about FDR’s high words of praise for Churchill. Those words were spoken and written in quantity throughout the largest war in history, which they fought together. Vox offered a familiar litany of Churchill sins, most of which have long since been refuted by reputable historians. Here they are—with our replies. It is a fact that millions of Indians starved. It is a fact that India was at the time a member of the British Empire (as it is today a self-governing member of the British Commonwealth; Britain laid the ground for this by establishing institutions of self-government in India that had not existed before the British came). It is also a fact that Britain under Churchill, along with other countries, shipped hundreds of thousands of tons of grain to India to replace the deficiency. The shortage was caused by crop failures, and by the Japanese invasion of Burma and nearby countries which had supplied rice to India. Arthur Herman concludes that without Churchill the Bengal famine would have been worse. Vox doesn’t mention the effects on food supplies of Japanese incursions, corrupt local officials, and merchants who hoarded grain in the hope of higher prices. The Guardian article on using gas against “Bolshies” quoted by Vox, involves a more toxic agent called diphenylaminechloroarsine [DM]—much tougher than tear gas, but not broadly life-threatening. Still, if Churchill actually countenanced dropping DM on Russian civilians, he is certainly culpable. But he did not. Nowhere, however, did the Guardian or IWMR say anything about deaths, or civilian casualties. In a September 1919 attack for example, “ten Bolsheviks were affected.” British troops were advised that in the event of accidentally inhaling DM, “cigarette smoking would give relief.” DM was quickly dropped. Reading the IWMR article, DM comes off as an ugly, disgusting, but generally non-lethal advance on tear gas. Reading Vox, it sounds like chlorine. Big difference; big exaggeration. That is neither accurate nor representative of Churchill. Paul Addison, a balanced historian, wrote that Churchill “seems to have played no part in the initial decision to recruit them. As secretary for war, Churchill had been preoccupied throughout 1919 by his crusade against Bolshevism. It was not until January 1920…that he realized the state of chaos in Ireland…. Churchill did not personally propose the Black and Tans, though he stubbornly defended them despite atrocities that exceeded their remit. Against that, he must also be credited with a leading role in forging Ireland’s independence­. The story has been recounted by numerous biographers. It was Churchill who somehow brought the warring parties together: not only the Lloyd George government and the Irish revolutionaries, but also the rebels and the determinedly loyal Ulster unionists. A more honest appraisal might consider that Churchill’s main foreign preoccupation at that time (especially after the death of Stalin) was a “settlement” of the Cold War, despite President Eisenhower’s manifest reluctance. His preoccupation, in other words, was world peace. These are only comments we can find by Churchill on the Kenya uprising. The reader may decide if this reveals “an unreconstructed racist who cut a swath of suffering and death,” in Vox.com’s kind words. It is true that Churchill used words like “blackamoors” and said Indians “breed like rabbits”—offenses, in modern convention, of genocidal magnitude. In his time, of course every Briton from the Sovereign to a Covent Garden grocer said such things. That may be shocking in a more enlightened age. But that is the way it was. Yet this is the same Churchill who demanded equal rights for black South Africans 1899; who endeared himself to Gandhi by defending the Indian minority in South Africa in 1906; who endorsed the concept of a Jewish national home, and praised the contributions of Jews to civilization in 1920; who would admire the democratic forms that emerged in India, Kenya and elsewhere, through British influence. 1 Forthcoming, Winston S. Churchill: Document Volume vol. 19, September 1943-April 1944. 2 Paul Addison, “The Search for Peace in Ireland,” in James W. Muller, ed., Churchill as Peacemaker (Cambridge: Cambridge University Press, 2003), 199-200. 3 Hugh Martin, Battle: The Life Story of the Rt. Hon. Winston S. Churchill (London: Sampson, Low, 1932), 200. For a full account see Winston S. Churchill, “How We Made the Irish Treaty” in Thoughts and Adventures (Wilmington, Del. : Intercollegiate Studies Institute Press, 2009). 4 David Anderson, Histories of the Hanged: The Dirty War in Kenya and the End of Empire (London: Weidenfeld & Nicolson, 2005), 294. David Elstein, “Letters: Tell me where I’m wrong,” London Review of Books 27 (11 and 14). 2005. 6 Minutes, Cabinet Defence Committee, 6 March and 21 May 1953, CAB 131/13. Gilbert Papers assembled for the forthcoming Winston S. Churchill: Document Volume 22, 1951-1955, to be published by Hillsdale College Press. 7 William Manchester, The Last Lion: Winston Spencer Churchill, vol. 1, Visions of Glory 1874-1932 (Boston: Little Brown, 1982), 844.